Listed below are all those that have crossed over the Rainbow Bridge. They are listed in the order of when they arrived at UIL Sanctuary. A large part of United In Light, is being able to allow these beautiful teachers to live out the rest of their lives. As they were all rescued from slaughter or an untimely death. Their memories are still amongst us here, running, playing and sending heart whispers in the Livingston winds. They each have amazing stories and they have each had amazing lesson to those that loved them. ​The Horse Angel Sculpture was made by Tom Mosher of "Steel your Heart" and donated by the Tecca Family. Knight is the Founder of UIL. Rescued from Slaughter in Central CA. He was found standing in a forgotten stall with rotten carrots and manure. Knight was a supposed Champion Cart puller from the East Coast. He had a very sore back and poor feet. Through the care of Chiropractic and other alternative therapies offered here at the ranch, he remains in great health and a sight to see! He was the first to be rescued and the reason why UIL exists today! Santana was with us for his last 3 years of life. Found in a feedlot outside of Cave Creek, AZ on 5-28-04. Santana’s history was unknown. The owner of the feedlot said he was on his deathbed. Santana had many problems and we were not sure that he was going to make it the first week here. Yet he turned around and healed amazingly, as well as being the best of buddies with Knight. He crossed over in AZ, December of 2006. He was a love, as we were blessed to have his presence with us those last years. Santana Winds chose his name as he was reminded that now he is free as the desert winds. 30+ year old Belgian, gelding. Update: We are excited as we are told that Santana has decided to come back as Molly Belle’s foal! Red Dawn was found and rescued on 6-28-04, from a feedlot outside of Cave Creek, AZ off to slaughter, together with Tatanka Spirit (below). No one had wanted them, as they were different breeds and did not match. ​Red Dawn chose her name from the many red desert colors of Dawn. She blessed us for her last 2.5 years of life before she crossed over and was mother to all the horses here. 30+ year Suffolk Punch mare. 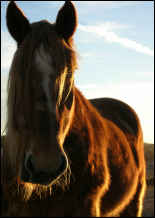 Tatanka Spirit was found and rescued on 6-28-04, from the same feedlot where Red Dawn (above) was found. Tatanka came with many trust issues and a terrible eye infection that had threatened the loss of his eye. He has come along way and has the heart and soul of an old Buffalo. It took Tatanka many years to recover from his distrust of humans. Here at the ranch he was able to decide if he wanted to be loved with hands on or from a distance. Update Tatanka Spirit crossed over peacefully 1-4-2015. 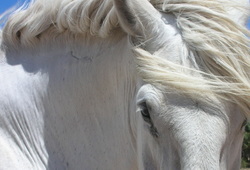 He was the last survivor of the original five that were the first horses to be rescued by UIL. Moonshadow was found in a Standing room only stall within a Barn, where he'd been for over a decade. With no sunlight, animal or human contact. He was found in NY by his rescuers Jill & Steve S. who took him home and called UIL for help. He arrived on 11-14-04. It took 2 years of training, as Moonshadow was so fearful of everything around him. He would even attack the other horses. One month prior to our relocation to MT, he was ready for the herd and has been a different horse. We owe much of that to Red Dawn, as it was the love they shared together that helped Moonshadow to be open to love again. When asked, he chose Moonshadow for his name as he arrived on a full moon and liked the way the light cast his shadow on the ground. True Freedom for Moonshadow! Molly was rescued by The Animali Farm from going to slaughter. She was a PMU mare from a PMU farm in Alberta, Canada who lost their contract with the manufacture of Premarin. She arrived here at UIL in November of 2007. ​Molly came to us pregnant! She had her foal, "Promise" in May of ’08. Due to health issues as a PMU foal, Promise crossed over in 2014 at the age of 5. UPDATE: Our sweet Molly Belle, crossed over New Years Day 2018. She was 28 years old. It was perfect that she joined the rest of the herd in heaven on such a spectacular day! We love you Molly! Little Willow came from a wonderful owner from TN in May ‘07 at 7 years old. She was very lame with Laminitis in all four hooves and other injuries. 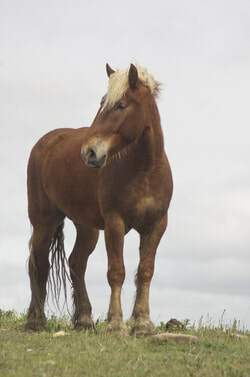 The owner chose UIL to retire Willow to live happily with other Draft horses. It was a great surprise as soon as Willow arrived she was jumping and running! She enjoys most of her time playing with Promise, the youngest of our rescues as well as being a great spokeslady for our retirees! She is a 15 year old Percheron. UPDATE: 2-11-15 Willow crossed over this morning on her own. Her beauty, kindness and grace will be missed. Prince arrived at the ranch in March '08. His prior life was located on a Farm in Utah that was open to the public. He spent his life pulling a wagon around the farm for visitors. One day he just stopped and would not pull anymore, he was done. The owner of the facility said “He is costing me money, so either find him a home or send him to slaughter.” He now resides here with us and has been a wonderful addition to the family. We must note… when Dr. Deb asked what was his name they replied “Prince of Dreams” Dr. Deb nearly fell over as the first horse rescued here has the name of “Knight of Dreams”. There are no coincidences in life! Update: Prince of Dreams Crossed over January 2011 with a very peaceful transition. Formerly known as Double D and Jacob, these lucky boys were found by Gentle Giants draft horse rescue in MD, where they lived for a month or two after their rescue from slaughter from the New Holland, PA auction. Gentle Giants had taken care of their many injuries to their feet and the horses had extensive rehab. When UIL had space available for more horses, Gentle Giants thought it would be best for the boys to retire here, living the leisure life with lots of love. Although it took one week for their travel from MD to MT (10-17-07) due to their old tired bodies and injuries, we are happy to say that they have healed tremendously and are great loves, now enjoying playtime, rearing up and bucking! Update: Jackson Hole (20+ year old Belgian) was a dear old soul and remained with us for a number of years before his physical body could no longer carry the large spirit he had. Update: Pumpkin crossed over in October 2011. His last days were laying in the pasture and enjoying life. Promise is the only Draft horse (so far) that has been born on the United In Light property. Molly Belle came to the ranch in November pregnant. She was on her way to slaughter. It was the intention that her foal was to go to slaughter as well. Promise has been an amazing blessing to the other residents here! Born on May 14th, 2008, all of the horses have had their share of helping raise Promise into the amazing boy he has become. We are going to continue to train Promise to pull and ride as he is to take over the job of Mascot. Knight of Dreams is ready to fully retire the job to Promise. Promise is half Belgian and his father was a black Percheron whose early life ended in slaughter. Promise will never know the hardships that the other horses here have had to live through, he only hears the tales they tell him. Molly Belle has been an amazing mother and we are happy to have allowed her to keep one of the many foals she carried. Lucky arrived at the UIL ranch Nov. 30th, 2012. 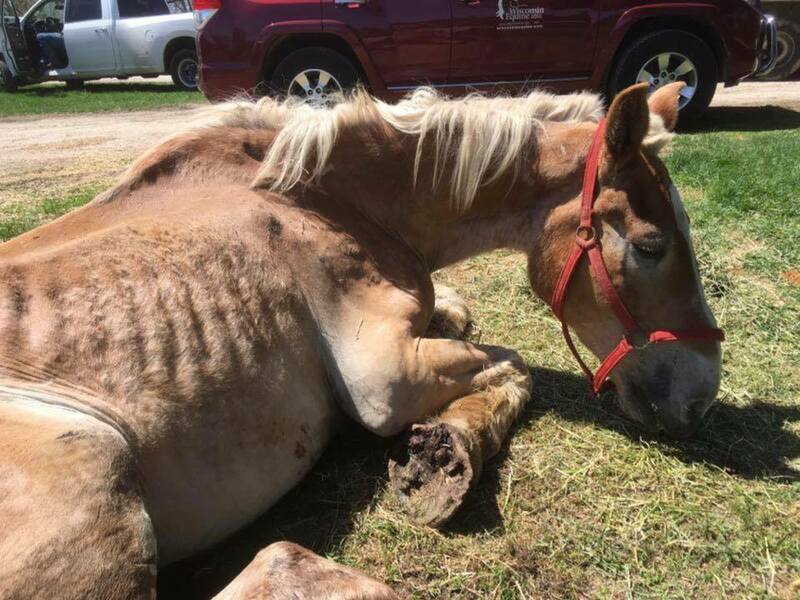 Lucky was found with 200-300 starving horses on a ranch in Idaho. We were told he was born July 2010. He, His mother and other horses escaped tring to find food and had the unfortunate event of being hit by a drunk driver (his mother did not survive), which left him with injuries including a broked leg, that would not allow him to drive or be saddled. Due to starvation of his first 2 years of life, we are not sure how much his growth was impacted...time will tell. 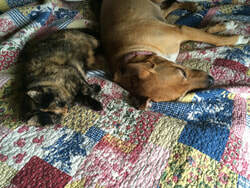 ​Lucky has adopted Molly Belle as his Momma. He has also found love in Ashley & Aribella. UPDATE: Dearest Lucky aka "Surfer boy" crossed over the Rainbow Bridge September 19th, 2o16. He's last days were filled with lots of apples and love from many visitors. He touched many lives. Lucky came to UIL wild and free and left this life still, wild and free. Daisy was found on Craig's List in great need of a home. She came from Grants Pass, Oregon and supposedly in her previous life, was a Stage Coach horse for Wells Fargo in WA state. She came to us in Feb 2010 with "Scratches" on her rear right ankle. After her arrival we uncovered that she has Cushing's Disease and her treatment is ongoing. Her original name was Tia "Thunder Down Under". Shortly after her arrival, we took notice of how sweet, gentle and shy she was. When asked, she preferred to be called Daisy T.
Update: Daisy was only with us for a little over a year. Although we were able to allow her to transistion by herself, surrounded by her family. March 31, 2011 She was a blessing. Jake is a 31 year old Gelding Shire Mix. UPDATE: Jake crossed over the morning of March 18th, 2015. His Gentleness will be missed. We know he is together with Willow over the Rainbow Bridge. William was found with Hawk and Eagle on a feedlot in Louisiana. Unfortunately, there was a horrific situation with the transporter and William had to be euthanized. The trailer was in horrible condition and his leg fell through one of the holes in the transport and was dragged over 4 miles. It is unfortunate that these thing happen in this day and age....He will not have died in vain. Thankfully, he was surrounded by loving hands and not to torchere of slaughter. He was 20 some years old. Furrow was found nearly starved to death as a wonderful individual came to his rescue and contacted UIL. We made arrangements with the owner in St. Ignatious MT. We found after his arrival that he was a registered Suffolk Punch and had at least four owners prior to UIL. He was nothing but skin and bones when he arrived yet now he is building muscle and putting on weight. He LOVES roaming the hillside by himself. He came to us at 25 years old in April 2015. He is a 27 year old gelding Suffolk Punch. UPDATE: Furrow crossed over August 20th, 2018. What an amazing boy, teddy bear to all and loved to be hugged. Even though his life was short with us, he touched soooo many lives. October is UIL's only cat & was rescued on a very cold raining October day. (Oct. 18th 2010) Dr. Deb had a truck load of 4H young ladies and as they were driving an animal crossed the highway and collapsed. When they stopped to check it out, there laid this poor cat, skin and bones starved nearly to death, with her nails so long they curled into her pads, she was cold and wet crying out. Dr. Deb took her back to the sanctuary if even just to comfort her until she crossed over. She was kept warm by a fireplace and fed until each day she grew stronger and stronger. Here she is laying with Maria. UPDATE: July 17th 2018, October crossed over. We are not sure of her age due to her circumstances yet we know she is in heaven nuzzling up to every animal and human there. Snuggles October.